Sponsored in part Consulate General of Republic of Poland in Chicago and Zywiec. Chicago's All Souls Jazz festival is the largest and most unique annual Polish-American Music Festival of internationally renowned jazz artists and talented young performers. It mirrors an annual jazz festival in the historic city of Krakow, Poland. Over time, the Chicago counterpart has grown to become a popular event with both the large Polish community and American music connoisseurs. 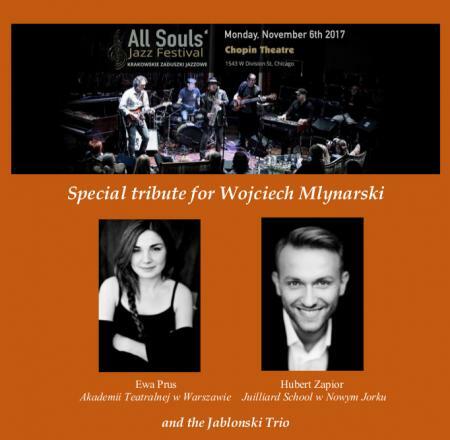 This year Chopin Theatre presents special tribute for Wojciech Mylnarski with guest jazz singer Ewa Prus (Academy of Warsaw) and opera singer Hubert Zapior (the famous Julliard School, NYC).